Funniest thing I've seen this year. Think Quentin Tarantino meets Dumb and Dumber. Yeah it's not a masterpiece. Yeah it's kinda sicko. 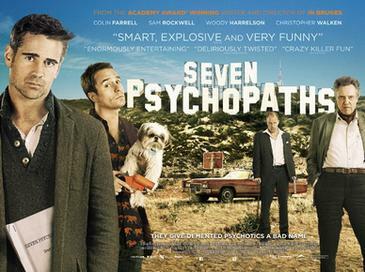 Written and directed by Martin McDonagh and starring Colin Farrell - so strong Irish connection - Begorrah! McDonagh has form - previous feature In Bruges was much praised. I missed it - a martyr to my studio as usual... This one has a strong a-list cast including Christopher Walken,Woody Harrelson, Tom Waits, Harry Dean Stanton and Olga Kurylenko (hot Ukrainian babe mostly seen in arty French numbers - I LIKE) fresh faces Sam Rockwell (killer performance) and Aussie blonde Abbie Cornish (a sort of younger, heavier version of Nicole Kidman x Naomi Watts, if you will). It's hard to believe it was financed by Film Four and the BFI, but I guess business is business. It's silly, but not as silly as God Bless America, which I'm also thinking of seeing.